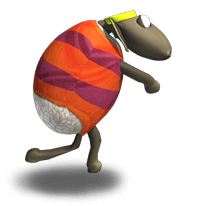 The sheep are training to get into shape - while many are sticking to the traditional disciplines of competitive loafing and grass munching, others are whipping out their training suits and jumping, running, bouncing and racing to be the best! The Summer Games are here! And while Mootown doesn't boast any world-class champions yet, it isn't stopping anyone from trying! You can help coach a particularly dedicated cheap in a 2 week marathon from now until Thursday, August 25th! Collect Acai Barries by harvesting cucumbers, radishes and tomatoes to power up your sheep. For every 100km your sheep runs, you'll get 2.5% of the points needed towards the next level! At certain special milestones you'll even receive various athletic sheep for a brand-new sports scene in your shadow box! Find out more in the forums, or get a running start in the game and check it out now!